Photo: Emily Wax/ Washington Post. Ahmed Abdulraham, 14, left, sits on a street with his friend Fecil Khmis. 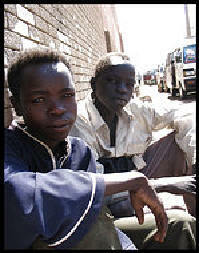 They are among an estimated 35,000 minors living on the streets of Sudan’s capital. Over the past 25 years, drought, wars, AIDS and economic collapse in Africa have torn families apart. KHARTOUM, Sudan — The morning call to prayer echoed through the city as Ahmed Abdulraham, 14, a small boy with cloudy, yellowing eyes, rose from his version of a mattress: a pile of trash spread across a gutter.